Buick’s Roadmaster arose from anything but humble beginnings. The brand’s new flagship was intended to spark images synonymous with power, handling, and elegant styling — all elements missing from General Motors’ Buick division since the 1928 model year. So Roadmasters were among the first in line to receive Buick’s latest and most powerful engines, the most recent suspension upgrades, as well as interior comfort and conveniences that rivalled Cadillac and other luxury brands. When the Roadmaster was first released in 1936, the advertising stated: “So we built this great-powered, trigger-quick, light-handling Buick Roadmaster, and it literally named itself the first time a test model levelled out on the open highway.” Over the next 20 years Buick’s stylish new Roadmaster was to be a status symbol targeting a more youthful market audience with moderate means, as well as the affluent. Fast forward to the 1950s, and catchy advertising slogans such as “The joy that only the finest can give” and “This you take in glowing pride” helped propel 1955 Roadmaster sales to a respectable 64,527 units. The sharp, less curvaceous lines, an extended bonnet, and a taller rear boot-lid combined with an overall more aggressive body stance, instantly rendered previous models as out of date. In essence, the new Roadmaster body was contemporary and stylish. Additionally, ongoing suspension development continued to improve the silky smooth drive, regardless of the road surface, and it was touted as the “Million Dollar Ride.” Further refinements were ongoing, but despite Buick’s best efforts, production and demand for large, medium-priced cars began to wane. The 1956 recession certainly didn’t help Buick. However, according to many, the styling refinements made during this tumultuous time were a vast improvement over the previous year. Such upgrades included a new grille and a V-shaped front end, while chrome trim remained slim and tastefully applied. However, that tasteful philosophy was short-lived thanks to the reintroduction of a chrome-laden three-piece rear light on select Roadmasters. The car was lengthened once again, and lowered, but customers and critics alike criticized the suspension for being far too soft. In its last incarnation, the 1958 Roadmaster was either viewed as stunningly beautiful or a demonstration of excess in chrome — after all, it was the late ’50s. After Roadmaster sales reached a dismal 14,054 units, its replacement, the Electra, was ushered in for the 1959 model year, thus ending production of one of the most iconic models in American automotive history. The Roadmaster name still resonates with collectors today, much as it did when new. 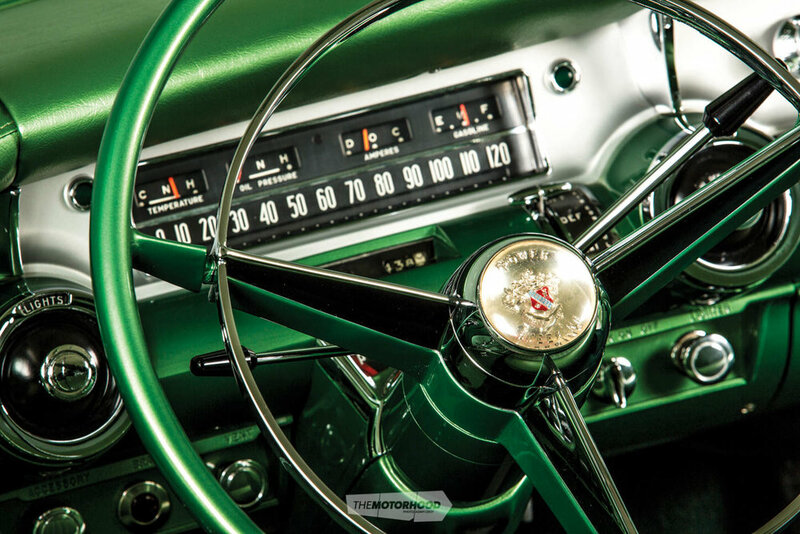 Fifties-era Roadmasters are undoubtedly comfortable highway cruisers, with interiors better described as a lounge on wheels, and offer unpretentious luxury at a fraction of the cost of a typical luxury collector car. “Burger King has got a lot to answer for in our house. That is where the Buick story began”. Way back — when it featured the old chequerboard vinyl and chrome, with rock ’n’ roll photos and ’50s car brochure shots — the burger joint was a drop-in treat. Whilst queuing one day and perusing the literature on the walls, Shaun spied a beautiful sleek, long and low stunner that really caught his eye — a 1957 Buick Roadmaster. That was that! The poster had him dreaming at every subsequent visit. Many years later, after a long flight, he got lost and arrived late one night at a relative’s home in New Jersey, USA. It had been a tiring day, and after a quick catch up, the ladies retired for the evening. Alas, that left the boys to their own devices, and as they didn’t feel sleepy, out came Jack’s finest. Shortly after, the topic of choice became classic cars, and a discussion ensued about their likes and dislikes. After he’d proclaimed his love for the above-mentioned vehicle, Billy (Shaun’s relative) asked if he would like to take a look at one in the metal. Silly question! The next morning found them at the home of Billy’s close friends — a New Jersey police officer with a keen interest in classic cars and motorcycles. Lo and behold, there it was: an extremely tidy example that he had acquired from a nearby house. Since owning the car he had completed some minor mechanical repairs and maintenance to get the engine running, after it had sat for 25 years in a garage with a bent valve, and he was now enjoying it with his young family. Shaun was impressed with the gorgeous sleek lines of the Roadmaster, and was even more impressed when he stood alongside it. After lunch and a few beers, Shaun left them with the suggestion that if ever they were to sell the car, could he and Rita have first option? Not too many months passed before the couple began to explore what they could do to “tidy the car up a bit” themselves, and they made the mistake of pulling things apart. They soon called on the expertise of Craig Reynolds to help dismantle the stainless steel trim and restore it back to its original condition. There was such a lot of stainless trim on this car that they were very happy to have found Craig at Auto Trim Restorations. According to Shaun, he has the patience of a saint and possesses the ingenuity to sort out a method to repair dents and dings where you would think it cannot be done. Craig’s work is the ‘bling’ that complements and shows off the great lines on the beaut Buick.Before Shaun and Rita knew it, the car was being transported to Graham Ridland at Creative Autobody in Glenfield, and the serious stuff began. The body was completely stripped apart, then acid dipped. After Graham had sorted the plethora of parts into many crates and boxes, things began to slow down, as he’d decided to have a change of direction. The car and all and sundry was transported back to Shaun’s shed until such time as they could find someone else to entrust with their project. John, Adam, and Sam at Cascade Autofinish in Pakuranga handled everything from the tiniest parts of suspension, chassis and interior, to the largest panels and rotisserie of the body. John’s input and advice was invaluable when the big decisions needed to be made. As usual, their workmanship produced a stunning, eye catching, yet traditional finish.Then James and Brendon at Jasco Automotive, in Manukau, worked their magic to bring the old beast to life again. They had first become involved with the build back in early 2009, with the Buick already disassembled. A bare chassis, a bunch of old parts and thankfully, an even bigger bunch of photos — which proved invaluable throughout the whole restoration process — arrived at their shop, along with two very enthusiastic owners. As far as the mechanical side goes, Shaun and Rita’s amazing Buick has been stripped down to the very last nut and bolt, and restored with passion. Obviously, the whole engine, transmission, diff and driveline assembly have been stripped, two-pot painted, and rebuilt, sourcing many new parts from the States: nothing was left untouched. Brakes, steering, and suspension all received the same detail. The linkages, rods, and virtually every other suspension component was refurbished and gold zinc plated. Any and every exposed bolt was also gold zinc plated. Basically, Shaun and Rita gave the team at Jasco licence to treat the Buick as if it was their own, and do whatever they wanted, and they did. Everyone was so involved that when Shaun procured an old 1957 Buick sales brochure showing some parts of the motor chromed, he suggested — and consensus was reached — to go ahead and add it to the look. Other items also received additional treatment, such as hyper-coating master cylinders and exhaust manifolds, and fitting a custom stainless exhaust system in an effort to maintain a clean no-rust look. Numerous components were reconditioned or NOS parts were sourced from the USA, but plainly, the car speaks for itself. The many stages of the build were always documented, and shown on Jasco’s website, to the joy of its many followers. Along the way, ideas were explored and improvements made to keep everything original mechanically, apart from aesthetics, paint colour and chrome work. The upholstery, trim, and sounds were handled beautifully by Ross and Stu at Stu’s Trim & Sound in Manukau. They were tasked with delivering a classic interior and colour scheme that really celebrated the ’50s whilst complementing the exterior colour choice, a custom green and off-white. The best period-correct green vinyl and fabrics sourced from America were close but not quite, so the exterior paint was changed slightly to match the vinyl. The off-white was matched the same way. The seats had been treated to new covers over the old ones probably 40 or more years ago, so stripping revealed the original seat design and some very tired upholstery. The uncovered original designs were chosen to be used for the rebirth. The seat frames were rust treated and the cushioning rebuilt, adding lumbar and lateral support. The colossal electric frame beneath the front seat was overhauled and rewired. Door panels were fabricated as per the original design, as were all the other interior elements. No kick panels were found, so new ones were fabricated from panel steel, and covered. For the audio system, the original radio was gutted and new internals were fitted by Neil, from Phoenix Audio. It now features radio, auxiliary and USB inputs, and it drives amplified speakers — a single dual-voice coil speaker in the original dashboard location, and two six- by nine-inch speakers in the parcel shelf behind the rear seat. The Alpine digital amplifier was mounted in a custom-made steel shelf beneath the back window, inside a custom-designed trunk storage area. This is where Shaun and Rita wanted to splash out and give the car a real defining touch. In the style of the ’50s interior, the team designed a boot space that hid away the spare wheel and other unsightly objects, while keeping them easily accessible. Custom-made stainless-steel luggage rails can support suitcases and yet-to-be-made matching bags for long cruises. 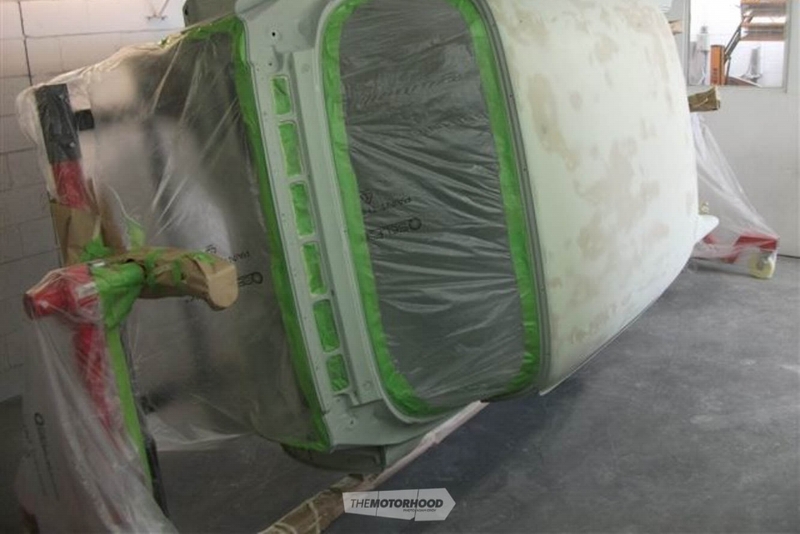 By late 2016, the Roadmaster was nearing the final stages of completion, and with a wedding looming, the push was really on to have the car finished. While it was being fitted out at Stu’s Trim shop, Glen and Greg from R3 Fabrications in Takanini were brought on board to complete the actual final fitting and last assembly tasks, to have the car road ready for the big day. The journey has been long, but the result speaks for itself. Shaun and Rita set out to achieve their dream machine, and Shaun doesn’t need to visit a Burger King any more — even if he could find one still as they were way back then! Ashley Webb joined Parkside Media 10 years ago as Advertising Manager for the newly created NZV8 magazine. When the opportunity arose to work on New Zealand Classic Car magazine as Assistant Editor just over eight years ago, he couldn't resist the challenge and has worked on the magazine ever since, and is now the Editor of New Zealand Classic Car. Ashley is passionate about most classic cars and has a particular interest in late ’60s US muscle cars.